Simplify Your Skincare Routine // Alex Carro | Almost Chic. As a general sense of overwhelm continues to envelop millennials it's no surprise that many are turning to a more minimal way of life. Capsule wardrobes have reared their head again and de-cluttering videos are having a serious moment on YouTube. But have you ever thought about simplifying your 10,000 step skin care routine? Barcelona based innovators Alex Carro are here to help you do just that with their all natural, cruelty free, mixable, multiuse, unisex skincare line. It is time to embrace minimal skincare ladies and gents. Balancing Face Oil It smells gorgeous. Deeply moisturises skin over night without making it greasy. A definite must try if you love Kiehl's Midnight Recovery Oil. Facial Cleanser As amazing as this cleanser is you probably have equally good ones in your beauty cabinet, wait until those are finished before you grab this one to complete your 5 piece set! Exfoliating Powder & Face Cream Since Alex Carro's entire ethos is based around the mixability of their 5 core products - I'd really like to try all the different product combinations. I can't very well do that without the whole set can I? Bye monies. Made it past my quick review? Great, lets get into some detail. First can we all just take a sec to appreciate how stunningly sleek the outer packaging and the bottles/tubs themselves are. You know when a brands aesthetic just makes you swoon a little bit? A lot of that happened when these beauties came out of the box. That glossy black shell with crisp white lettering is all kinds of perfect. Aside from the modern minimal aesthetic though, what is Alex Carro all about? As I mentioned - one of the main focuses when creating this brand was mixability. The set of five core products aims to meet everyone's basic skin care needs with intelligent blends of natural ingredients. For those who want to go above and beyond the standard cleanse, exfoliate and moisturise routine though, the creators of the brand encourage creating extra skincare solutions by mixing certain combinations of the 5 products you already have. Thus reducing the need to have endless lotions and potions in your bathroom cupboard. Declutter your space and tailor make your own skincare to suit your needs perfectly. Sounds good right? An example of these combinations would be the multiuse balm - it's primary use is as a moisturising balm for dry lips and skin. Add a bit of the exfoliating powder, however, and you have a smoothing lip scrub - without buying an extra product which you might only use once every couple of months. My favourite combination is the Facial Cleanser + Balancing Face Oil which creates a softening and deep cleansing mask. Get the idea? Full info on the different combinations can be found on the website here. The brand's inventive approach to skincare really stands out in a marketplace who's main focus is to convince you to buy more products. The Alex Carro boffins have taken a refreshingly simple approach to looking after our faces and encourage you to buy less. Their versatile capsule skincare routine can be customised for all skin types, is gender neutral and cruelty free. It's a no brainer surely?! Winter is coming. Some days in Scotland this "summer" it felt like winter never left to be quite honest. And we all know that winter and chapped af lips come hand in hand and I, unfortunately, find myself to be a particularly bad sufferer of the dry lip affliction so I am delighted with this soothing little lip balm. The shea and cocoa butters plus calendula, chamomile and neroli make for an incredible smelling and very softening lip product. Though its not suggested as one of its uses I've also been using it as a temple balm because the scent is just so relaxing and spa-esque. Its also great on hard to shift dry patches. It has a very solid textured balm in the pot but it quickly melts when you get your fingers in about it. A definite competitor to my all time favourite lip balm from Nuxe. As with all the products in the Alex Carro collection the Facial Cleanser is simple and does exactly what it says on the tin. The texture takes a bit of getting used to. When dispensed from the tube it has a gel consistency - you'd expect it to be a foaming gel cleanser, or at least I did. However, when massaged in to the skin the cleanser has a kind of thick oil texture. You know the popular oil cleansers are very thin and glide over the skin easily, well similar to that except its take a bit more massaging to work in. I prefer to use it by massaging it directly in to dry skin to loosen my makeup and then after a couple of minutes of working it in I rinse with warm water or remove with a flannel if I'm feeling fancy. It doesn't foam but rather becomes milky and rinses away all my makeup easily. I do prefer to double cleanse or use an exfoliator after this step to really get rid of any deep grime - which is where the exfoliation powder would come in really handy. Again the product has a gorgeous natural and subtle scent that is reminiscent of days spent chilling in a spa. After use the cleanser does leave behind a slight film, which I personally enjoy sometimes as it feels very moisturising, however if you are a fan of a squeaky clean feeling post cleanse I'd definitely recommend some form of double cleansing. Finally the balancing face oil. I absolutely blooming' love this oil. Firstly thanks to the amazing selection of essential oils in this beauty, such as evening primrose, lavender, patchouli, geranium and more it smells INSANE. Like, UH-MAZE-ING. Unlike the other two products, which as I mentioned have a very subtle fragrance, the balancing face oil's scent packs a punch. A really relaxing, dreamy punch...! It is such a joy to apply before bedtime and wins all the sensory feel good points. My skin feels soft, plump and hydrated by morning without being oily. I wouldn't necessarily use this as part of a morning skincare routine as it does take a while to fully sink in meaning that if you want to apply your make-up straight after you could struggle. It reminds me very much of Kiehl's midnight recovery (and actually has a lot of similar ingredients) so if you're a fan of that cult beauty oil you'll definitely love Alex Carro's offering. Overall I'm very impressed with Alex Carro's products and by their general ethos and integrity. If you're interested in trying just one thing I'd say choose the balancing face oil and if you're fully convinced and want to invest in all 5 I'd definitely recommend the gift set of all the products. This may be expensive as a one off purchase but it works out cheaper than buying each of the items separately. Is anyone else excited to see what's coming next in the rise of minimal skincare? 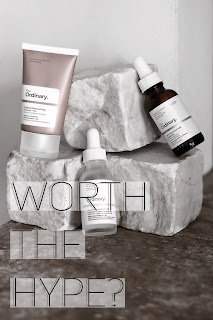 If you liked this brand focus style review you may also enjoy my recent review of DECIEM's The Ordinary.